I’ve been further reflecting on this micro-managing mania of mine these past few weeks (see post below) and realize what an awesomely complex thing it is we do every day managing our blood sugar — and what an amazing thing it is we assume we should be able to do what our pancreas does automatically by taking pills or injections of insulin, watching what we eat and trying to use exercise as a sugar burner. I imagine many times my blood sugar skyrockets from 105 to 310 merely because I’m frozen behind this computer trying to come up with my next witty line. Then there’s getting sick but you don’t know it yet, as in wow, where’d that cold come from upon sneezing. Again, your blood sugar’s rising unbenkownst to you. There’s the female once a month hormonal surge which many women suffer: more insulin resistant a few days ahead of your period, more insulin sensitive a few days in. Yet with increasingly busy lives lots of women don’t make the connection each month. How about teens going through puberty with a host of uncontrollable growth hormones? How about seniors who’ve been told they have to change their whole lives or die early, with miserable suffering along the way? Then there’s the food thing, the label says this packaged corn muffin has 12 grams of carbohydrates, so you shoot up “appropriately” and two hours later your blood sugar is over 300, well mine was! 12 grams? I don’t think so: a liberal use of the word carbohydrate on some regulator’s part? There are so many factors, external and internal, that affect our blood sugar that I marvel at our innocent hubris to think we can really regulate our blood sugar with accuracy, for a lifetime no less. I hear you, this is the part where you say, “Get a continuous glucose monitor already!” But it’s kind of like how I feel about the pump; I don’t want an attachment on my body, beside CGMs aren’t perfected yet, you still have to test with your meter so what’s the point? And with 7 or so checks a day I pretty well know how I’m tracking, after the fact. 7 or so checks, that’s rolls off my fingers, and lips, as though it’s just everyday business. There are no answers here, just wide-eyed musing that 14 milliion patients in the U.S. have been duped — acting like we can really control our blood sugar. I mean really, it’s a whopping assumption with our current practices; seems we are both foolish and heroic at the same time. 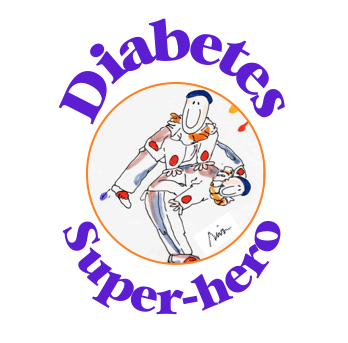 Perhaps worse, doctors and diabetes nurses and educators are under the same delusion — that we can do this with any consistent accuracy and not fall into despair from time to time befitting the everyday acts we perform. I think we all need a good, fresh dose of reality: Do your best, appreciate that we have some tools, recognize it’s still a barbaric and hopeful process — and hang on to that hope because as things speed along we may actually crack this nut, or make managing diabetes a more automatic, less patient-dependent, emotionally-laden, burdensome process. For all my disgruntledness, I am excited to see what will be in the diabetes management toolbox five years from now, ten years from now. Meanwhile, I’ve decided to cut myself some slack, no, lots of slack, not about the discipline I bring to my management, but my expectation of how often I shouldget it right, lather myself with forgiveness when I don’t, and recognize in this crazy process the courage, valor, strength and optimism I bring to it all — and should be congratulated for living this way each and every day. I think you should congratulate yourself as well for the mere fact that you’ve chosen to take it on day after day after day.